What do you do if you’re the supervisor or manager of a problem employee? What if you are the target of bullying behavior, yourself? Or if you are accused of acting like a bully? As a manager, it’s up to you to be a role model. You need to insist on being treated respectfully yourself, and you need to provide a safe and respectful atmosphere for your people. Sure, it takes courage to confront a disruptive team member. And, yes, you may be tempted to look the other way when a star performer is the one who is behaving badly. Or when under-performing employees disappoint you again and again—well, it’s admittedly tough not to treat them harshly yourself. 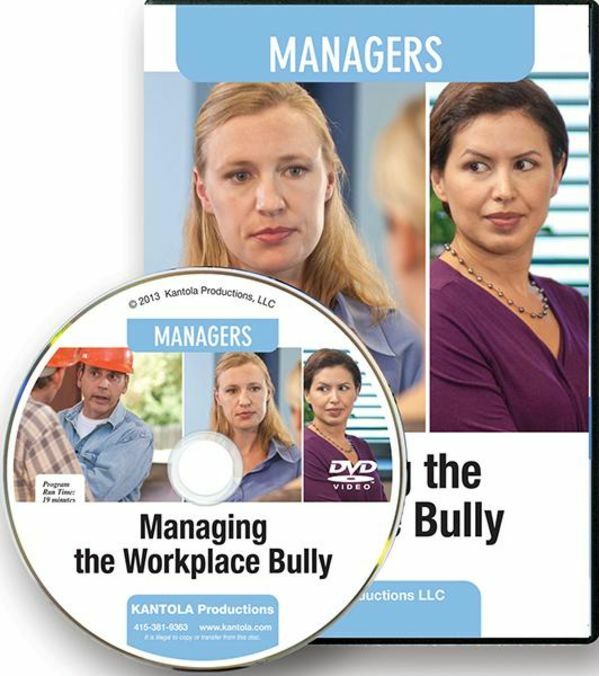 This brand new release tackles these issues head on, providing practical solutions that help you put an end to bullying behavior in your subordinates—and find new ways to deal with your own frustrations so that you don’t end up looking like the bad guy. Sometimes high performers get away with bullying even though the harm they cause far outweighs their accomplishments. Bullying reduces engagement and productivity, increases absenteeism and turnover, and adds stress that damages health. The costs of bullying are never justified, no matter how “irreplaceable” the bully may seem. A complimentary Study Guide with Quiz and Certificate of Completion is included with each DVD purchase. The intended audience for this video includes all managers and supervisors.